Anyone who uses the internet is a potential target for fraudsters. At U.S. Bank, our first priority is protecting your personal information. For added protection, U.S. Bank’s systems will automatically log you out of U.S. Bank Online Banking after 15 minutes of inactivity. This timed log off reduces the risk of unauthorized access to your account from an unattended computer. U.S. Bank’s mobile applications (for smartphones, iPads and other mobile devices) will automatically log you out after 5 minutes of inactivity. This shortened log-off period helps reduce risk from unauthorized access to your account if your mobile device is lost or stolen. We encrypt your confidential banking data to protect it on route to and from our servers. U.S. Bank needs you to be our partner in the fight against fraud. We can’t do it without you. 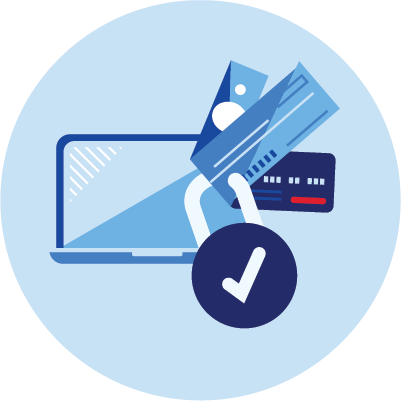 To learn more, read 10 Steps to Minimize Your Risk of Fraud and Theft (PDF) and Fraud prevention tips (PDF). What to do if your wallet is lost or stolen. Read "Lost Your Wallet?" (PDF) to learn what to do if you have a lost or stolen passport, U.S. Bank cards, other credit or debit cards, driver’s license, checks, Green Card, Social Security Card, membership cards or insurance cards. Make a list of everything in your wallet before you lose it. Include contact numbers in your wallet list so you have the information you need to cancel or reissue your cards. Store this information in a secure location that you can access if you lose your wallet. Note: Never carry your Social Security card in your wallet. The more paper with personal information you have laying around, in your garbage cans, or sitting in your mailbox, the greater the risk of your personal information getting into the wrong hands. Sign up for "Hold Mail Service" with the U.S. Postal Service if you plan to be away from home for 3 to 30 consecutive days. Call the U.S. Postal Service at 1-800-275-8777 or submit a "Mail Hold" request online. Download "Beyond the Bank" (PDF) to learn more about preventing mail fraud. Getting U.S. Bank statements online eliminates your risk of identity theft or fraud as a result of stolen mail. Online statements provide all the same information as paper statements. You can view and print statements, and manage your account online. And as a bonus, you’re helping U.S. Bank protect and conserve natural resources while improving your security at the same time. eBills are electronic versions of paper bills (for example, utility bills). By going paperless with eBills, you eliminate the risk of having bills lost or stolen from the mail. Thousands of companies are already signed up with the U.S. Bank eBill service. Set up eBills to be paid automatically - or choose each payment date and amount. Make one-time payments, or set up recurring payments. Get alerts when an eBill is delivered or a payment is processed. See up to 18 months of payment history online. Identity theft can happen to anyone, but there are steps you can take to minimize your risk of becoming a victim. Don’t be a victim! Download "Fraud Prevention" (PDF)to learn how to arm yourself against identity thieves. Computer viruses can install malicious software ("malware") programs on your computer without you knowing it. Anti-virus and anti-malware software helps detect and remove viruses and other types of malware from your computer. Anti-spam software helps prevent spam and junk email from entering your inbox. Don’t install software offered through pop-up windows warning you that your computer is infected. These may actually install malware! To securely close a pop-up window, do not click the "X" in the upper-right corner of the window. Instead, right-click on the task bar button (at the bottom of your computer screen), and click Close, or use the Task Manager. If you cannot close the window using these methods, exit and restart your Internet browser. Your computer should have a firewall. Firewalls help protect your computer against criminals who want to crash your computer or delete or steal confidential information. Firewalls come prepackaged on some operating systems or can be purchased for individual computers. Need help with Anti-virus or Firewall software? Schedule weekly checks for new software updates in "system preferences"
Private information stored on your computer’s hard drive should be erased or destroyed before you get rid of your computer. First, make a backup copy of any important data you want to save. Then, to erase information permanently, you must either wipe (or “scrub”) your hard drive with special software or physically destroy it (for example, by drilling holes in it). These steps are necessary because your files may be easily recoverable even after you have deleted them or put them in the “recycle bin” on your computer and emptied the bin. Learn more about how to safely dispose of old computers and hard drives. Keep your computer operating system, Internet browser, and other software up-to-date for additional protection against fraud and theft. Most current operating systems have the ability to automatically update critical system files. Take advantage of this to better protect your computer. When you buy a wireless router or cable modem, it comes with a default password set up by the manufacturer. Be sure to change the default password to your own unique password. Following the manufacturer’s instructions, make sure the encryption (for example, WPA2 or WEP) on your wireless router is turned on.